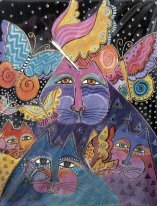 This is a package of 8 blank note cards and envelopes featuring Laurel Burch's design of cats and butterflies. Each note card is 4 1/4" wide x 5 1/2" high. Printed on recycled paper in the USA. Photos and content © 1999- Catty Corner.